Further Information: This monthly event is both a business meeting and a social event. Members, non-members, newcomers and visitors from other groups are welcome. Attendees are expected to wear an attempt at medieval clothing – garb – or to borrow from Gold Key. Food and drinks are available at reasonable prices (bring your own feast gear if possible). Usually there is some period music and dancing, and there may be some arts and crafts, a merchant or two, or a swap table. Tavern night is an excellent opportunity to meet local people, ask questions and share ideas. 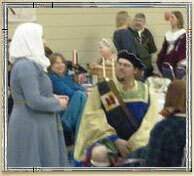 Tavern Hosting – Tavern nights are possible only because someone volunteers to act as host for the evening. New volunteers to run this event are most welcome. There is a Tavern Binder which has all the information needed for running a successful evening. Getting the key, opening the hall and setting up the tables and chairs by 7:30 p.m.
Purchasing and preparing food which resembles period dishes. Finding 2 – 4 volunteers to help with set-up, serving and clean-up. Selling food and drinks (beverages provided) and collecting donations from all in attendance. Cleaning up, locking up and returning the key. Filling out an ‘Income and Expenses’ envelope and giving it — with the profits inside — to the Exchequer. This may sound rather challenging, but others who have hosted taverns will be happy to give advice and assistance.